Kitchens are one of the best and worst places in the house – a lot of time is spent creating delicious meals and memories in the heart of the home, but trying to keep your kitchen organised and looking like it belongs on kitchen inspo board for Pinterest can seem near enough impossible – especially if you’re running a family home and life is non-stop. We’ve found a few genius kitchen storage ideas that have made us green with envy whilst weeping with joy as they are all DIY! When it comes to underneath the sink of a kitchen you’ll find one of two things – a lot of wasted dead space, or row upon row of half empty cleaning products. 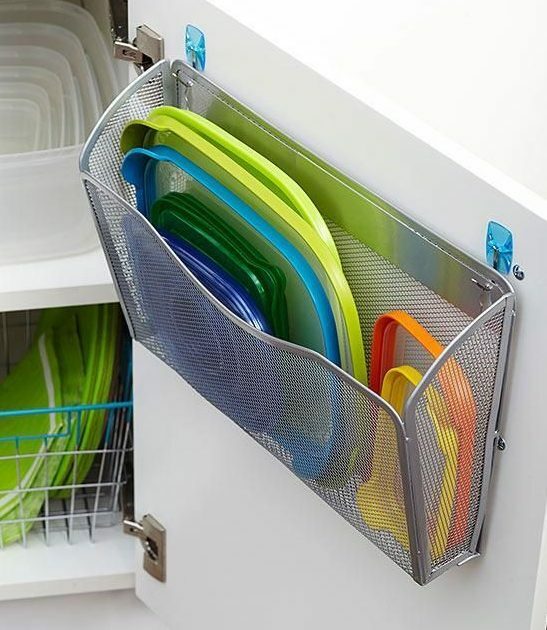 Pull out wooden or plastic drawers are the perfect solution to finding the cleaning bits and bobs you need without having to pull everything out and put it all back in again. A few drawer systems and some shallow wooden trays do the trick perfectly! You can check out some of our kitchen sinks here. Replace the tattered old boxes with a couple of miniature curtain brackets and a tiny pole on the inside of your kitchen cupboard. 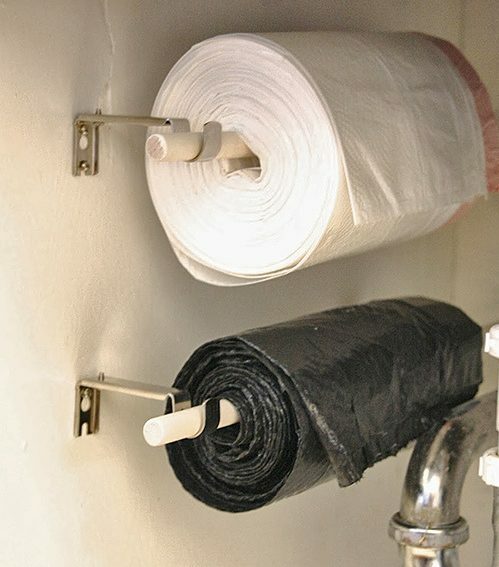 This means your bin bags are accessible, easy to pull off and makes changing the bin a little less of a chore. Want to do something similar? Check out our fixtures and fittings here. The frustrations of finding the correct lid that fits your lunch box is one we all know too well – you have to sift through cupboard after drawer hoping to find the right size. However, this quite frankly genius hack of hanging a re-purposed metal tray on the back of a kitchen cupboard drawer in order to hold said gold dust deserves a scholarly award. Have a peruse through our Kitchen Cupboard door and wall units to see if you can spark the imagination! 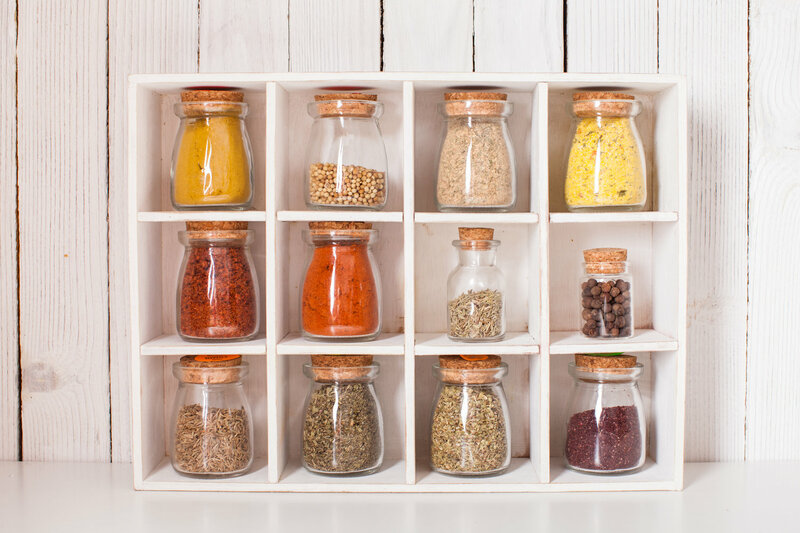 Spice Racks are becoming more common in the home, but this spice rack is one that makes us a little jealous… After all, herbs and spices are the perfect way to enhance dishes and ignite passion when it comes to cooking in the kitchen. 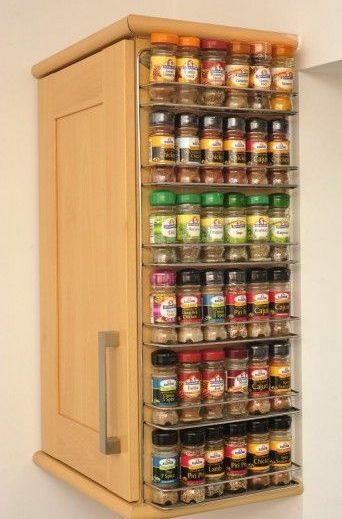 This made-to-measure spice rack is clearly a must have – you won’t have to knock a few over when trying to find the sage for your Sunday roast… Check out our spice racks here. Finding a way to fit everyone and everything in a small kitchen isn’t the easiest task, which is where a fitted kitchen comes in. However, although they are full of creative and personalised ways to store things, sitting family and guests down to dinner is often forgotten about. This Kitchen bench made into a kitchen bench is the best kind of kitchen-ception. The inside of the seated kitchen bench could also act as a another bit of hidden kitchen storage! Have a look at our range of fitted kitchens here. For advice on how your kitchen and bedroom storage, why not give Lark and Larks a call? We’ll help find the perfect storage solutions for you. Call 0121 788 2819 or get in touch.